Every month, Institut finlandais highlights creatives whose work shed light on today’s Finland and France. Lokal is a gallery and a concept store in the heart of Helsinki exhibiting Finnish art and design. Lokal is often referred to as THE place for design in Helsinki. The gallery was established in 2012 by Katja Hagelstam and it presents the local know-how and new creators in a cosy, homelike environment where art becomes interactive and accessible. 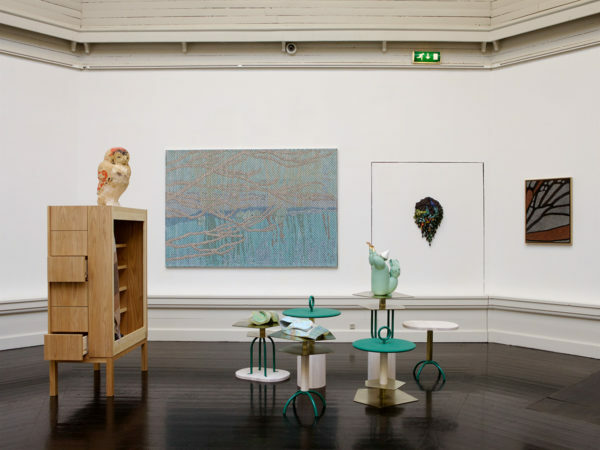 Katja Hagelstam has curated the opening collection of the Institut finlandais, called “Juhlat” (Celebrations) which exhibits items related to the theme – light, handmade and festive. Katja, who received a state prize from the Arts Promotion Centre Finland in 2017 for her work with Lokal, shared her thoughts of Helsinki, curiosity and feel of material with us. You founded Lokal in 2012. Could you tell us a little about the story behind it: what inspired you to open the space? How has it evolved over the years? Opening my own space was never really a part of my plans. In 2011 right before establishing Lokal I had finished a book project called 20+12 together with Piëtke Visser. At the time, Helsinki was named as the Design Capital of 2012. We wanted to make a book focusing on Helsinki to also present views of the city. For the book, I had photographed a lot of designers, their apartments and offices, bits of Helsinki and the visual look of the city. I wanted to make an exhibition of these pictures and treasures I had come across during this process. I happened to see an empty business premise at the centre of Helsinki, and after some rapid decisions, I decided to open my own space. A lease for three years obliged me to make some definite choices, and instead of opening a pop-up retail I decided to invest in something more permanent. Up until then, I had worked mostly as a freelance photographer, and I had never managed my own space. Of course, I had photographed design, decor and food a lot, I had also developed my own strong taste. Especially in the beginning, the exhibitions were homelike which arose strongly, for example, through exhibiting furniture. Through photography, I had built worlds and while constructing the exhibitions, my idea was building pictures in a three-dimensional form. The principle of Lokal is that a visitor can experience art in a cosy, homelike environment still giving room for imagination. People might often have a high threshold to enter galleries, so I wanted to create a warmer and more welcoming environment. Now after six years and over 50 organized exhibitions, Lokal continues its operations with the same principle. What is the idea behind the name Lokal? Choosing the name was a fun process. Lokal means ‘local’ in Swedish and English (though misspelt) but also ‘space’ and ‘apartment’. A local space. I wanted to show the art and design of local creators, and this aspect has become more and more important to me over the years. Lokal lives and changes along with every exhibition, and the direction has become clearer over the years. In the beginning, I wanted that everything from coffee mugs to dishcloths would also be on sale in these exhibitions. I had also planned a bigger role for coffee than what it is these days. Lokal is especially known as a stepping stone for young designers and artists. What is your secret in finding talents? The process is rather unsystematic, I rarely go out myself to find someone specifically. Usually, someone recommends someone to me, I listen and look, or someone might come to display their work. We organize about eight exhibitions in a year, thus, the rhythm is quite dense. Earlier most of the exhibitions were larger combinations where easily 20 artists would participate in. Nowadays we organize also smaller exhibitions of only a few artists. I believe that the current trend leads to cutting back from excessive items that we do not need and the importance of quality will be emphasized. How would you describe the current climate of the creative sector in Finland and Helsinki? What kind of changes has there been in the environment over the last few years? The years 2011 to 2012 were quite important years in the city culture of Helsinki. Lots of new projects were created and a new sort of energy was clearly visible, new things appeared in the street scene, such as public saunas and Restaurant Days. Also, some smaller initiatives, which later became important, arose among the citizens. This marked a certain turning point and liberation in the artistic scene. What kind of things and features do you appreciate in a designer and in a well designed, handmade product? Already the mere feeling that the item is handmade is important to me, of a good product it can be seen and felt. Of course, functionality is an important feature as well. I believe that the current trend leads to cutting back from excessive items that we do not need and the importance of quality will be emphasized. What it comes to materials, I do not have specific favourites, instead, I like everything that feels honest and right. All the basic materials. For a designer curiosity and courage are important, irreplaceable features, but also understanding the traditions is important. Not everything has to be reinvented. I also love traditional things, for example, when a young designer uses a traditional technique to make a new and “updated” version. At the end of August, you participated with Lokal to a fair focusing on arts and design called the Chart, organized in Copenhagen. What kind of an experience was it? For the first time in the Chart, there was unity focusing on designing. There were 12 international galleries participating, two of which were Finnish: Lokal and Lemmetti. I had a lot of interesting discussions with people, especially about the borders between art and design – in the Chart this question was a hot topic. In the fair, Lokal presented a concept where unique design and artworks were in interaction with each other. It feels like this line is about to disappear more so in the future. 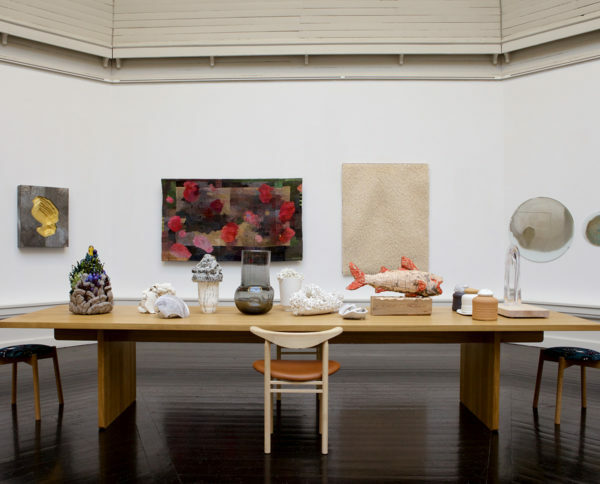 In the exhibition, there were 12 artists and designers. It was the first experience of fairs for Lokal, which made it especially exciting. We continued with Lokal’s familiar principle: it was a diverse group exhibition which included fun encounters and contexts. We gave importance to the materials and a strong cosy feeling. The exhibition included Renata Jakowleff, Inka Kivalo and Outi Martikainen among others. Bold and exploring artists who take a stand. What kind of a fall Lokal has ahead? The fall of Lokal will be exciting, it includes a lot of different combinations. The young artists’ exhibition we have now will continue for little over a month. After that, we will present a collaborative exhibition of Matias Liimatainen and Sanna Lehto, in other words, there will be encounters of photography and pottery. I have already previously worked with both of them; their idiom links in an interesting way.